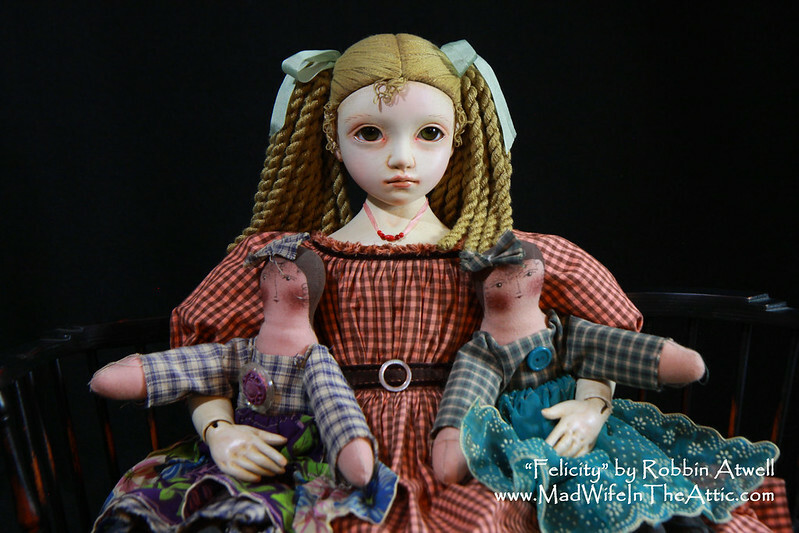 Izannah Walker continues to inspire my doll making. 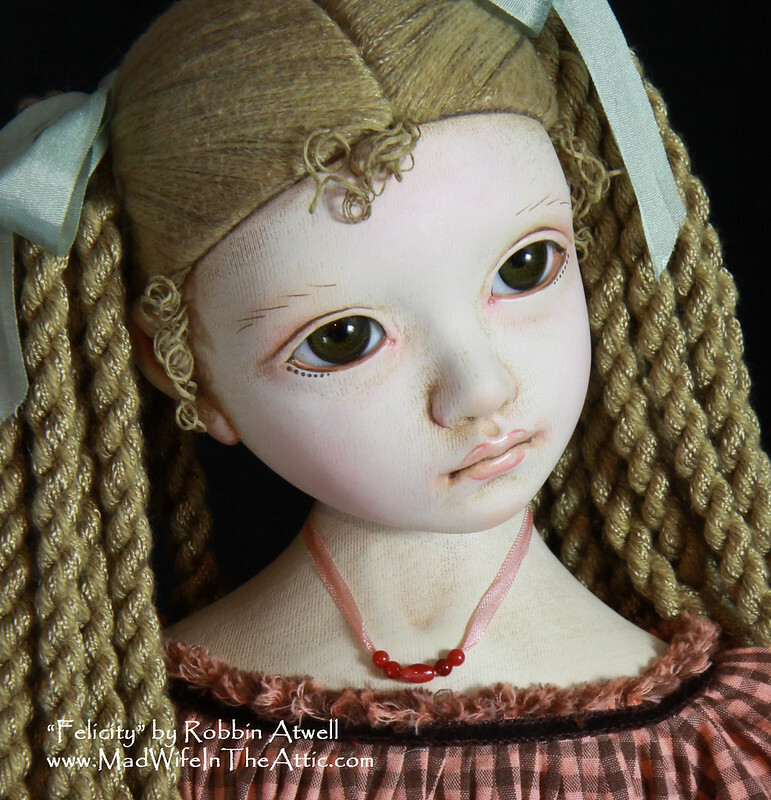 With “Felicity,” I’ve further developed her body design and added inset glass eyes. Felicity has a cloth body that is rigidly stuffed. She is jointed at the neck, shoulders, elbows, wrists, hips and knees. Her head is cloth over clay. She is painted and her hair is cotton floss. She stands 21″ tall. 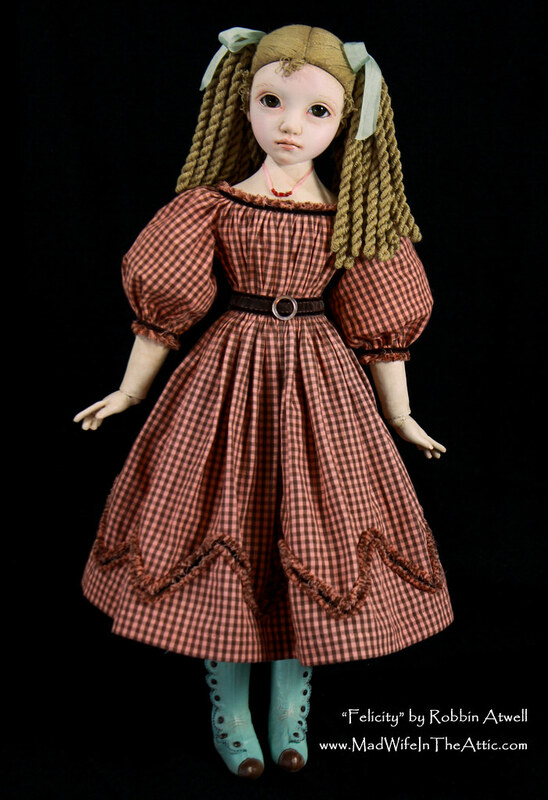 Please refer to my previous posts about Izannah Walker dolls which provided my inspiration (link) and the post about “Jubilee,” my first Izannah inspired doll (link). 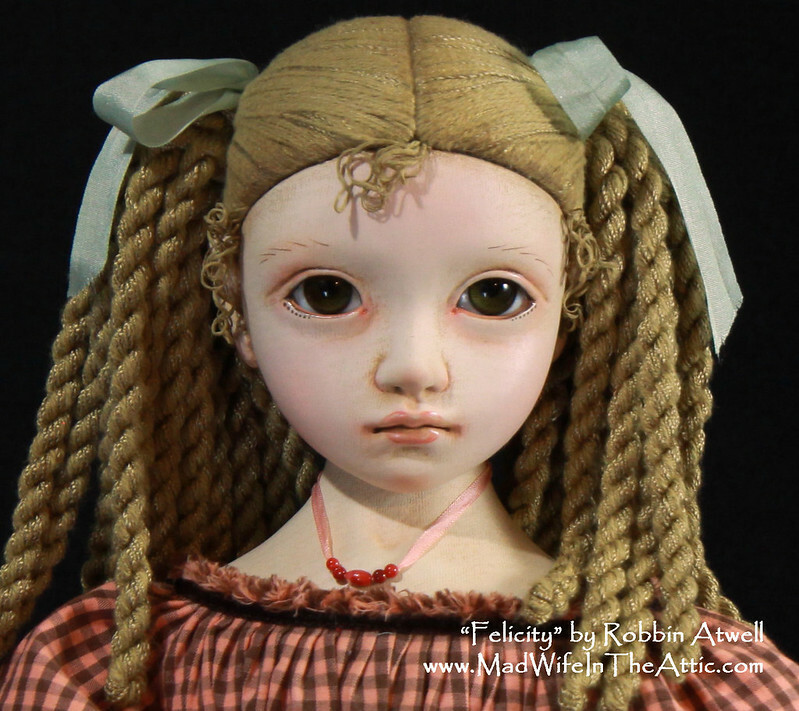 In future posts, I will be sharing some of my process for making Felicity. Please check back for the designing, sculpting, and stitching. 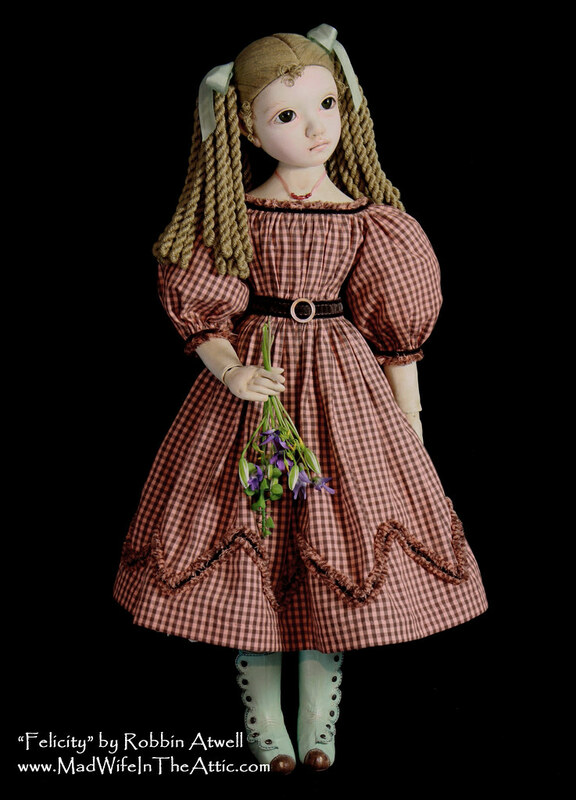 Although I’ve gone far afield from Izannah Walker’s dolls, Felicity still has the round face and placid expression of her doll ancestors. Her large eyes and rosebud mouth have the same facial geometry too. I didn’t paint her hair like the vintage Izannah Walker dolls, but I used cotton floss for her hair to keep a vintage, home-spun feel. I sculpted Felicity’s head in 3 pieces which allowed me to inset her glass eyes and form her hair style as part of her scalp (instead of making a separate wig). I also jointed her head at the neck so she could expressively tilt her head. Here, she is seated with 2 friends. Notice her hands. They are stuffed and both the thumb and index finger are separate. I added a wrist joint so that she could hold things. I enjoyed browsing Pinterest for 19th century fashion inspiration. I saw many belted dresses, lots of plaid, and lots of ornamentation. I came up with this design which isn’t a direct copy of any one dress. I used brown and white plaid and over-dyed it to get this salmon color. The trim is velvet ribbon and fringe made from the dress fabric. I made the shoes of painted fabric which mimics leather. It was very hard to decide if I should “antique” her or not. It’s very difficult to take something pristine and rub dark paint all over it! In the end, I decided to go for it. I like the effect. It makes her features more pronounced along with giving her a more vintage look. 26 Mar	This entry was published on March 26, 2018 at 6:21 pm. 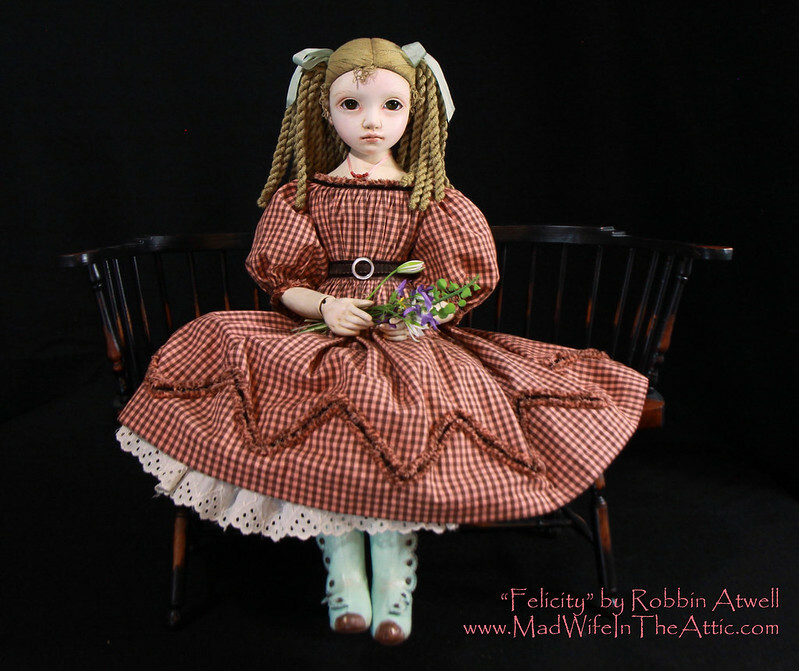 It’s filed under Doll Clothes, Doll Making, Sewing, Uncategorized and tagged clay, Cloth Doll, Crafts, Dolls, Handmade, Izannah Walker, Robbin Atwell. Bookmark the permalink. Follow any comments here with the RSS feed for this post.